Allo! 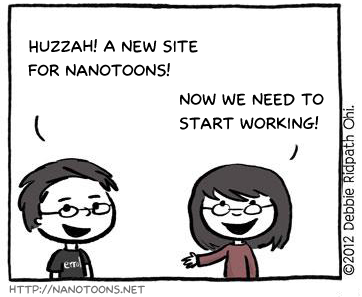 Errol here, welcome to the new site of NaNoToons. We hope to keep all the NaNoToons in one place this year, along with the archives! We have all sorts of things planned for this year. Well, actually, I’m hoping Debbie Ohi has all sorts of things planned. Anyway, if all goes well, we may be able to start early again this year! Feel free to drop us a comment!